Are you stuck out in the field during the hottest part of the day but required to wear all the cumbersome hi-vis add-ons to your already sweaty outfit? How would you like to ditch the layers for just one great hi-vis (class 2), breathable, and protective shirt? If so, say hello to Ergodynes GloWear performance hi-vis shirts, the 8280BK and the 8281BK! So there are a total of four choices (2 of which I tested). There is a short sleeve and a long sleeve cut, both available in either “lime” (pretty much florescent yellow) and orange. 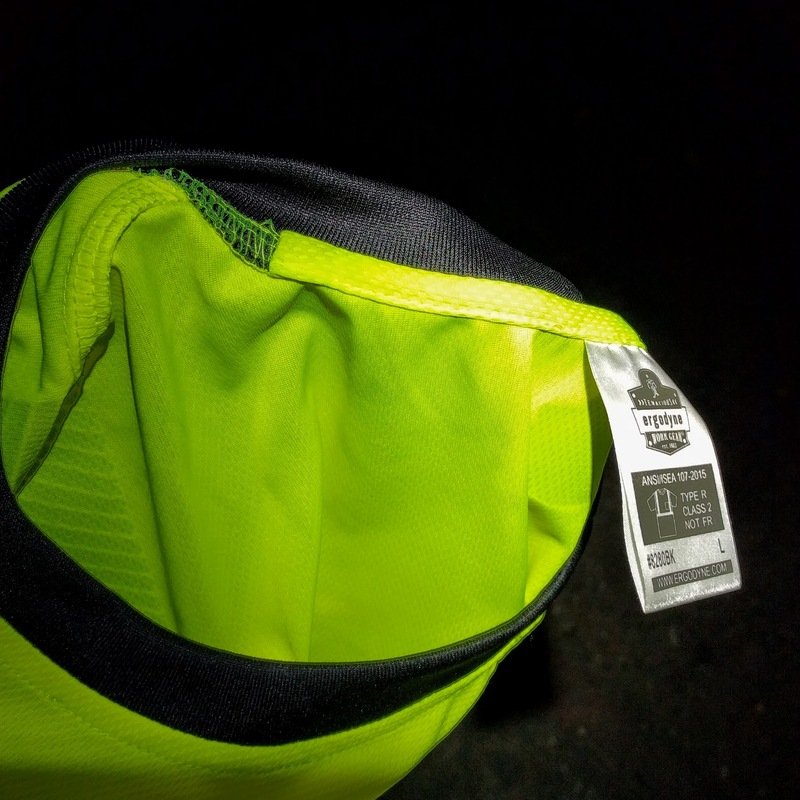 Regarding your choice of color, if you traditionally wear a hi-vis vest and plan to continue to do so, I’d suggest getting the opposite color of your vest for increase visibility. If things are really heating up for you and you plan on ditching the vest, I’d say chose a color that matches your vest. Of course different industries lean towards one color or another, but the key is to have as much contrast to the background of the site you’re working at or the contrast of your own attire. I’m 6’2″ and about a 41 size jacket, and I chose size “L” for both (available in “S” to “5XL”, see size chart here) and they both fit great. Below are pictures and some overall comments of both sleeve-lengths. The short-sleeve is a great option for shorter assignments when you might not have to be outdoors all day long. This one was definitely my favorite look as both the top of the black fabric in the front aligns closely with the end of the sleeves. You just still need to wear that sunscreen; however, many guys neglect it because they are either too busy or it doesn’t look very tough-guy. It really only takes a couple of bad burns to teach the seriousness of working all day in the sun. The long-sleeve is the most sun-smart choice as it completely cover your arms. The sleeves also afford some extra abrasion protection from smaller nics. 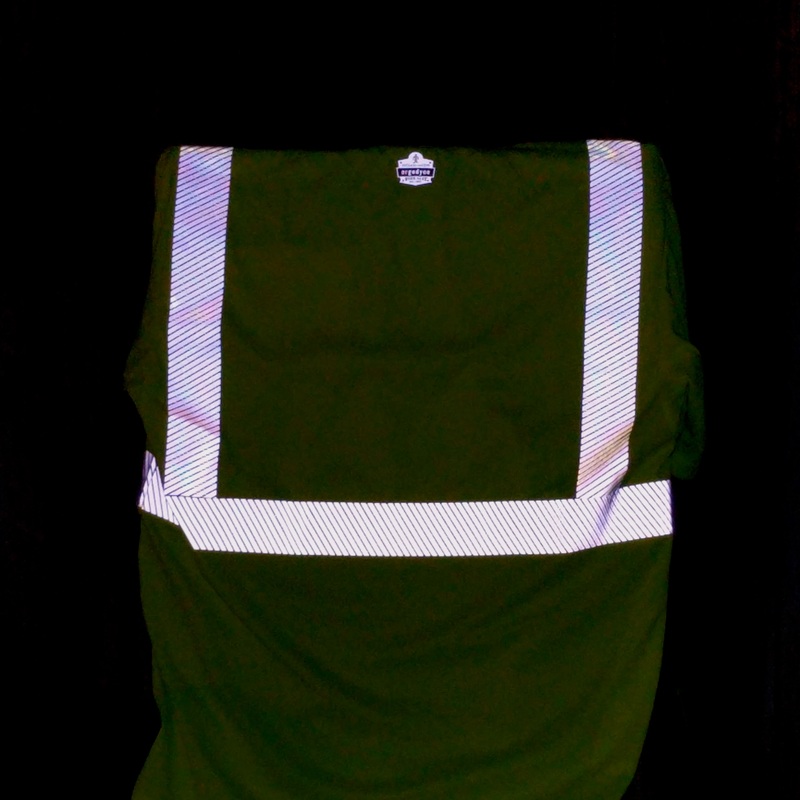 This version also provides more hi-vis fabric to help get you seen, which also may help if signaling cranes or lifts on the site. Visually, I’m not fond of the mis-aligned black fabrics but maybe that helps you be seen better? I would have also liked an extra ring of reflective tape around each arm, maybe right inline with the hz stripe at the solar plexus, which may have helped with the mis-aligned black fabric too. Both shirts have polyester breathable knit fabric which is super breathable AND super soft! This ain’t your basket ball jersey, the mesh is very fine so no skin actually shows. Speaking of skin, the fabric is boasts a UPF of 30! which means that only 1/30th of the sun’s rays can get through this fabric (for at least the first 75 washes). This is the feature that really sets this one apart for me; not only is the fabric for the whole garment already very breathable, but they go the extra mile and design under arm air flow! Both shirts use 2″ ANSI-compliant 3M™ Scotchlite™ Comfort Trim™ and are certified class-2 hi-vis garments. The part that makes it a “comfort trim” is that the tape is actually segmented which allows for greater flexibility and has less structure while means less warping after many uses and washes. Besides the awesome fact that the collar is black and will hide the sweat and some dirt, the seam around the back of the collar is also covered with more soft fabric. This is small but wonderful detail that will help prevent chaffing after a long day. Long sleeve – the black waist and the black arm cuffs are not the same length, thereby creating a kind of juxtaposition making the waist overall appear too long and high. I’d suggest wearing black pants to match the long sleeve version or to tuck it in. Long sleeve – I would have liked a hi-vis strip around the fore-arm somewhere to show my movements in the dark. CivilGear received this product for testing and proving an honest review.